We Want Bingo ✦ Get £25 FREE + £400 of No Lose Bingo! When players first sign in to We Want Bingo it's almost like stepping into one big bingo party. The site is decked with bright graphics, colourful balloons and the whole vibe of the site just feels good. 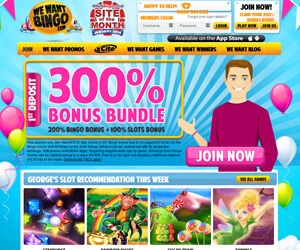 It's no wonder We Want Bingo was Which Bingo's Site of the Month in January 2014. We Want Bingo is easy to join and the incentives for doing so are massive. To begin with, when you sign up you can claim £30 bonus after depositing your first tenner. You'll then immediately be able to access £400 worth of No Lose Bingo where you simply cannot lose. Additionally you'll also be able to enter the £150 Free Money Draw. Other top promos at We Want Bingo include the £500 Power Hour with 500 quid up for grabs. There's also a lovely 75 ball bingo tourney for a sweet new iPad Air 2 and another 75 ball tourney to win a brand new iPhone 6. Also, every Monday there is happy hour between 4-6pm where you can play to win double loyalty points. However, Lord Bingo's favourite promo is the Win Free Bingo For A Month exclusive promotion. The title of the promo speaks for itself. 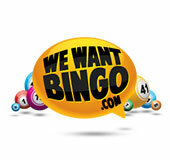 Have at it and enjoy the incredible selection of promotions at We Want Bingo! We Want Bingo prides itself on having the most fun chat rooms and the friendliest chat hosts. They always make the bingo rooms even more exciting to play in. Also, if you have any questions the hosts are there to answer anything and reassure you all they way on your new bingo journey. We Want Bingo offers fantastic 90 ball bingo, 75 ball bingo, special High 5 Bingo, tons of coverall jackpots, progressive jackpots and more. Moreover, if you are looking for something more than bingo, they've got you covered with their featured games like Jack and the Beanstalk, Starburst, Gonzo's Quest, Fluffy Favourites, Irish Luck and loads of other top titles.